Just $6.08 per resident per day is the average spent on food and ingredients in Australian aged care facilities, according to a recent study. The prevalence of malnutrition in aged care facilities is estimated to range anywhere between 32-72 percent, and a decrease in food budget and expenditure could further negatively affect the nutritional status of aged care residents . 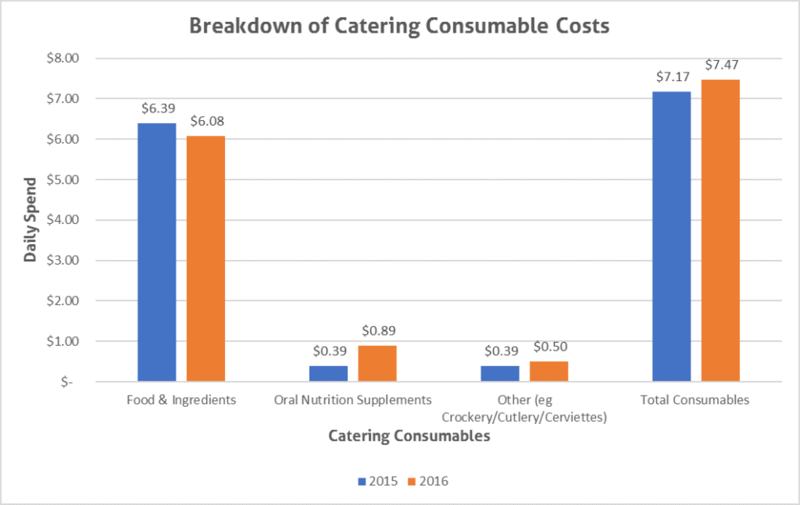 A recent nutrition and dietetics study examined the 2015-16 financial year expenditure on catering within Australian residential aged care facilities. The study comprised of 817 aged care facilities, representing 64,256 residential beds. The study reported that average food expenditure decreased 5 per cent from $6.39 to $6.08 per resident per day. Expenditure on oral nutritional supplements and food replacements, however, increased by 128 per cent . Supplements can provide a short-term benefit to complement the nutrition intake for residents suffering malnourishment or weight loss. This is particularly the case where older adults require an increase in energy and good quality protein. However, supplements do not improve the resident’s long-term quality of life, nor do they address the underlying cause of the malnutrition or weight loss . Aged care experts agree that a nourishing, food-first approach will have a better long-term impact on the resident’s quality of life . One of the key management techniques for people with dysphagia is the use of texture-modified foods and thickened liquids. However, until recently, there have been different standards around the world for measuring the thickness of specialised texture-modified foods and liquids. Furthermore, the naming, ranking and colour identifiers for texture-modified foods and liquids varied from region to region. 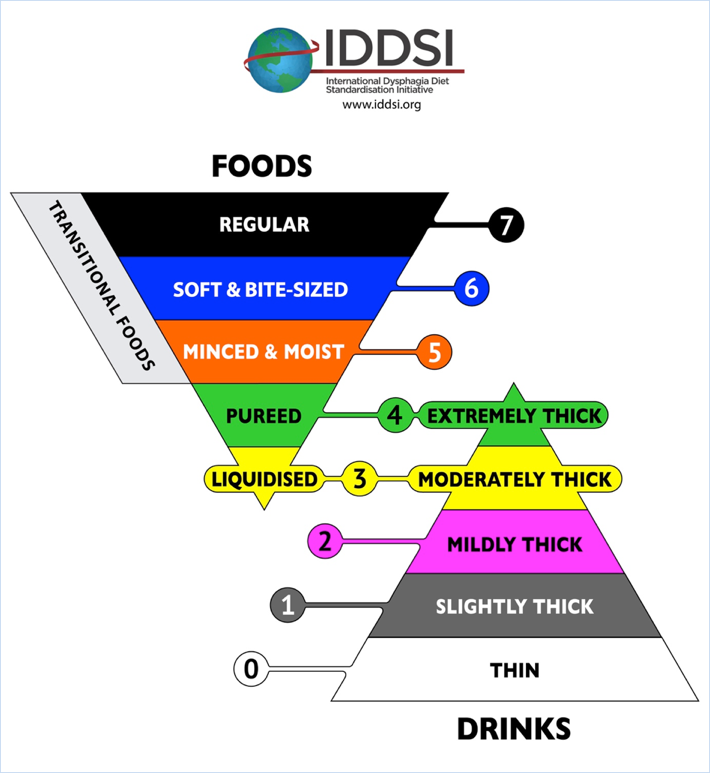 Universal standardisation of measuring viscosity was the key reason for the formation of IDDSI – the International Dysphagia Diet Standardisation Initiative. IDDSI was founded in 2013, with the aim of developing standardised definitions and terminology for texture-modified foods and liquids which are used for people with dysphagia. The standardisation was designed to suit all cultures and care settings. IDDSI is run by a group of volunteers from various backgrounds, including nutrition and dietetics, speech pathology, medicine, occupational therapy, nursing, food science, engineering and technology . IDDSI’s key goal is to develop a standardised method for naming and describing the foods and liquids used in people with dysphagia across the lifespan. It is important for there to be measurements of food and liquids, as appropriate thickness and textures help to prevent choking for those with dysphagia. However, there was a lack of consistency across countries and cultures that made defining food and liquids difficult. IDDSI worked towards creating globally accessible definitions. Another important step was to develop a practical measurement technique for foods and liquids that could be used by anyone, including patients, caregivers, food service companies and health practitioners. IDDSI has two key frameworks: the measurement and definition of texture-modified food, and of thickened liquids . Food and liquids are assessed and ranked according to their viscosity. The chart below shows the rankings and names of each level. There is an overlap of foods and liquids at levels 3 and 4. The colours were chosen by IDDSI to be universally standardised, and took into account people with colour blindness and symbolic colours (e.g. red is a universal medical colour for alarm or danger) . IDDSI’s method for measuring liquids is also known as the ‘flow test’, with ratings on a scale from 0-4. The liquid is placed in a 10ml syringe, and allowed to flow out of the nozzle for 10 seconds. The nozzle is then covered to stop the flow, and the loss of fluid from the syringe is measured. Extremely thick liquids, or level 4, will retain 10ml, and so are best measured using the fork drip test. Moderately thick liquids, or level 3, will retain between 8-10ml. Mildly thick liquids, or level 2, will retain between 4-8ml. Finally, slightly thick liquids will retain between 1-4ml, and thin will retain 1ml or less. In order for this test to be accurate, the correct syringe must be used. The 10ml scale must measure 61.5mm, and the nozzle needs to be a slip tip . The IDDSI method for testing soft foods and extremely thickened drinks is also known as the ‘fork drip’ test. Texture modified foods are ranked from 3-7, as evident in the chart above. For this test, the food is placed on a fork, and observed whether it flows through the prongs of the fork. The amount of food which flows through the fork will determine if it is suitable for levels 5, 6 or 7. For liquidised food and moderately thick drinks, or level 3, the food or liquid will drip slowly or in strands through the prongs of the fork. Pureed food and extremely thick drinks, or level 4, the food or liquid will remain in a mound on the fork, with only a small amount forming a small tail under the fork. This test assesses whether a food is sufficiently liquidised, or if a drink is sufficiently thickened . IDDSI has video tutorials for each of these tests on their website, to guide consumers, practitioners and manufacturers. In 2016, Speech Pathology Australia (SPA) and the Dietitians Association of Australia (DAA) ran a forum regarding the adoption of the IDDSI framework. They believed that it has many benefits and would encourage international research efforts in dysphagia. However, there were some concerns about transitions, funding and resources. Therefore, they are continuing to use the current Australian Standards for Texture Modified Foods and Fluids at this time. A committee has been formed to plan and gather resources for implementation of IDDSI in the near future. Although it may be a number of years away, both the SPA and DAA are working towards implementing IDDSI’s standards for measurement and classification of dysphagia food and beverages . IDDSI.org. (2017). About Us – IDDSI. [online] Available at: http://iddsi.org/about-us/ [Accessed 14 Sep. 2017]. IDDSI Framework: Testing Methods. (2017). [ebook] IDDSI. Available at: http://harborpower.com/iddsi/IDDSI%20Framework%20-%20Testing%20Methods.pdf [Accessed 14 Sep. 2017]. DAA.asn.au. (2017). New IDDSI framework endorsed – Dietitians Association of Australia. [online] Available at: https://daa.asn.au/2016/12/new-iddsi-framework-endorsed/ [Accessed 14 Sep. 2017].